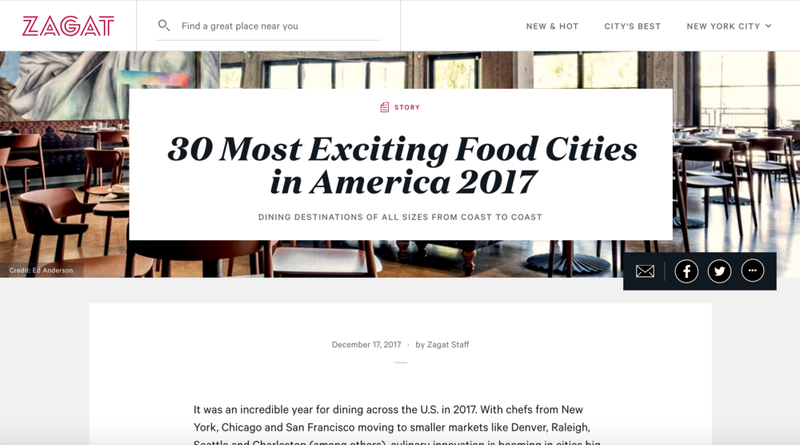 It was an incredible year for dining across the U.S. in 2017. With chefs from New York, Chicago and San Francisco moving to smaller markets like Denver, Raleigh, Seattle and Charleston (among others), culinary innovation is booming in cities big and small. But which food town had the biggest growth spurt this year? For one final look back, we've asked editors around the country to make a case for the city they believe had the biggest year in food by assessing the number of exciting new openings, award recognition and national media attention. Then we let some of the top food media brass weigh in on which locales were most exciting. Don't see your pick on the list? Let us know in the comments. All eyes are on The Magic City, especially after Food & Wine relocated much of its staff to Birmingham earlier this year. It's delivering with a wave of globally focused eateries like the popular Pizitz Food Hall (pictured above) with stalls representing cuisines from Ethiopia, Asia, the Middle East and more, plus Fero, an Italian restaurant from lauded NYC chef Akhtar Nawab (Alta Calidad). Favorite local sushi chef Abhi Sainju opened his first solo concept, Abhi, and hip EastWest serves modern Asian fusion. Birmingham continues its legacy of Southern cooking and fine-dining establishments like chef Frank Stitt’s Highlands Bar and Grill (James Beard Award finalist) with top-notch farm-to-table concepts like Roots & Revelry from chef Brandon Cain (Saw’s Soul Kitchen, Post Office Pies) and Root to Tail from chef and Food Network host Ben Vaughn. On the sweets front, Big Spoon Creamery, a small-batch ice cream concept from two Bottega vets, opened a storefront, and hit pop-up Hero Doughnuts found a permanent home in Homewood. This year, chefs in The Gateway City prove there’s no place like home. Vicia (pictured above) — the year’s biggest opening and a Bon Appétit best new restaurants finalist — brought chef Michael Gallina (previously Blue Hill at Stone Barns) back to his hometown, and NYC’s Danny Meyer makes a homecoming of his own with the opening of the state’s first Shake Shack. Local chefs are working to present elevated concepts in an accessible way, like Privado from chef Mike Randolph (Público, James Beard semifinalist), serving intimate tasting menu dinners twice a week, and Square1 Project, a pop-up concept at a secret location from St. Louis native Logan Ely. An incredible food truck community — which includes Balkan Treat Box and Guerilla Street Food — and restaurants like Nudo House and Nixta are introducing local palates to global cuisine, while quick-serve burger joints like Hi-Pointe Drive-In and Mac's Local Eats are slinging high-quality bites.